Dimensional Beast is an Enemy in Lords of the Fallen. 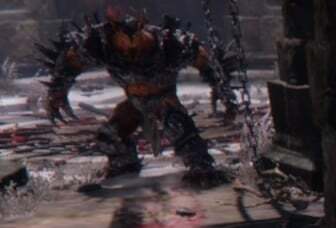 Enemies are hostile creatures and humans that Harkyn encounters throughout the game. They have different resistances and drops, sometimes leaving behind powerful Weapons. Dimensional Beasts are short but aggressive creatures that specialize in hand to hand combat against the player. Normally they tend to be found in groups of two or greater and aim to overwhelm their enemy. They are first encountered before and during the fight with Worshiper and later on can be found near Beastmasters. General - The best method of fighting Dimensional Beasts is to wait for an opening before dealing a blow against them. It's recommend to use a slash attack pattern if dealing with multiple beasts. Casters - Simply using a clone is the best method of distracting Beasts, once they've taken the bait you should be able to deal multiple blows on them.